We love hosting play date's, we love having T's cousins round for a few themed activities and food and so we can see each other. Although T sees a lot of his cousins separately, the 3 of them don't get to see each other at the same time very often. 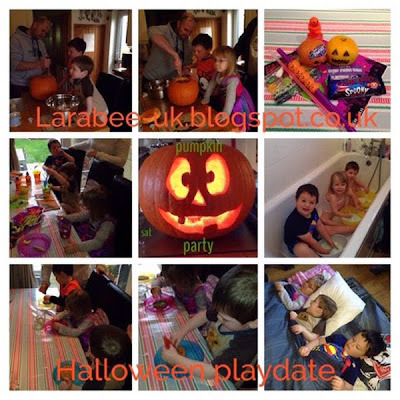 Our Halloween playdate was our first one and we had a great day. The Hubs and I spent quite a bit of time planning the day together, we both wanted our play dates to be a joint affair! The Hubs took charge of our first activity and helped the little ones carve a pumpkin, although T was the only one who was willing to scrape out the pumpkin guts! After everyone had a hand in carving the pumpkin, we had some lunch, there wasn't really anything very spooky or themed, only the tableware. The food was just veggies & dips with cocktail sausages, I didn't want to 'theme' it too much and run the risk of putting them off!! I did do jelly in spooky glasses, topped with a little squirty cream and ghost sprinkles! After lunch they all laid down for a rest in a nest on the floor, they watched a Scooby Doo Halloween film, this was supposed to be for T to take a nap, but of course, he didn't! After their rest it was time for another activity, this time it was monster gloop, with pumpkin stirrers, they especially liked this messy activity. As the oldest, Molly liked it the most and showed the boys how to mould the gloop, we all got very messy, myself and Sis included. After a bit of clean-up, we decorated pumpkin cookies. It was time to go and everyone took home a spooky party bag filled with, a clementine pumpkin, spooky bubbles, a pumpkin straw and lots of goodies! 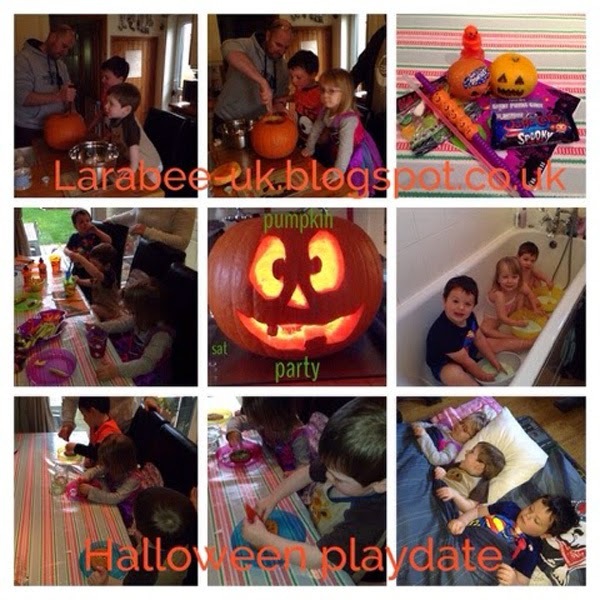 We hope you like our Halloween play date. It's just the 2 boys and me this year and in the evening we're going to have an adults scary Halloween evening - I can't wait, I love Halloween! !